A Diabolus in The Lost and Damned. 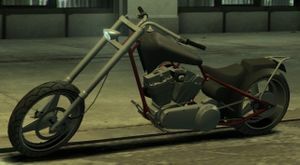 The Diabolus is a chopper style motorcycle in The Lost and Damned, originally existing unfinished in Grand Theft Auto IV game files. Much like the Hellfury, the Diabolus is best described as an aggressively designed custom chopper sporting modern, unconventional design cues, similar in design to the real-life West Coast Choppers El Diablo. In comparison to the Hellfury, the bike is identifiable by its thinner frame, different exhaust pipes, exhaust note, and an added buddy bar above the rear fender. The bike is available with any one of two gas tank design and any one of two exhaust pipe deigns. The unfinished GTA IV version of the bike differs slightly from the final TLAD design, featuring a more compact and less radically designed gas tank that features the Diabolus name, and lacking any rear license plate. The Diabolus in The Lost and Damned is a gang vehicle ridden by members of The Lost Brotherhood. A Diabolus extracted from the PC version of Grand Theft Auto IV. The Diabolus in its finished form in The Lost and Damned. The Diabolus' performance is fairly poor, as the bike has only average acceleration and a top speed of around 120 kph/74 mph. The bike suffers from poor steering that constantly results in understeers and wide turning radius's if cornering in full throttle. In other respects, the bike's grip and brakes are average. Although the bike is durable in firefights, its long length, as are many long choppers in the game, makes it impractical for agile chases, and is normally incapable of performing wheelies or stoppies. Brian's Diabolus is crimson with golden frames. Terry's Diabolus is blue with blood red frames. Clay's Diabolus is purple with gray frames. While these bikes features colors that are consistent throughout their appearances in The Lost and Damned, their gas tank and exhaust pipe designs may change in each appearance. The default radio station in the Diabolus is Liberty Rock Radio 97.8. The name "Diabolus" is Latin for "devil". Can be found parked on the west side of the Lost MC Clubhouse, in the alleyway. Always parked at the The 69th Street Diner in Hove Beach. Parked behind Brian Jeremy's house in "Bad Standing". Can be delivered by Clay to the player after completion of "Angels in America". Occasionally ridden in traffic by The Lost Brotherhood in Lost territories. This page was last modified on 22 August 2013, at 20:03.